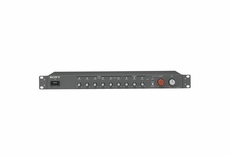 The SRP-X100 Audio Mixer is a multi-purpose mixer designed to provide high quality affordable mixing capabilities to a wide range of business meeting, boardroom, educational and house of worship needs. Housed in a compact 1U size rack mount body, the X100 includes 6 mono and 3 stereo input channels with flexible routing to master, sub and record outputs. The SRP-X100 has a unique "separate" switch that when switched on, only the Mic input signals are available from the mixer's Sub output, and only the Line input signals are available from the mixer's Master outputs. Supports installations requiring a separate output to send pre-amplified mic signals out of the mixer and into a separate loudspeaker system.